Sending and following up on emails is an important part of all our jobs, however each one of us prefers to do it at a different time of the day. While some people check and respond to emails as soon as they get to work, some keep it for after lunch or some do it even when they commute to work. If you are looking for a common time to get the best attention for all your emails, there's never one. And it is impossible to wait and send each email based on its best time when it would be noticed. 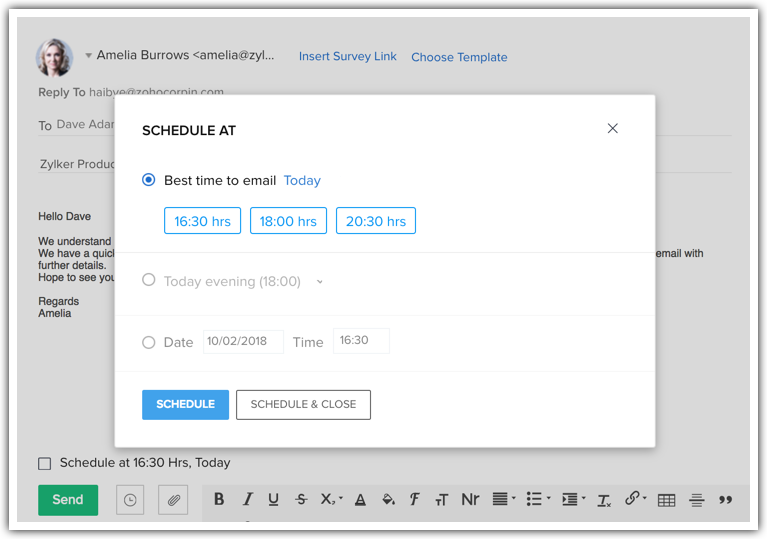 If you are facing something similar (or even if you are not) and you want to improve your emails' reach, then here is a tip for you - schedule your emails that are sent from Zoho CRM by simply specifying when you want them to be sent and the system will take care of sending them at the right time. Best time to email - as suggested by CRM. Pre-defined options for scheduling (Today, Tomorrow).